When two teams hang 51 points on their opponents, you can be pretty sure that it was a good week for garbage time. That was definitely the case in Week 9, and not just in the Rams and Jaguars games. In fact, more than 25 percent of plays this week were run in either garbage time or CG time, and it’s just the third week this season the league has exceeded the quarter mark. As the endurers of the Rams’ and Jaguars’ offensive outbursts, Eli Manning and Brock Osweiler spent the most time in garbage time this week — 38 and 40 plays, respectively. But they finished second and third in garbage scoring. The Bills ran 30 garbage plays, and Tyrod Taylor was able to parlay them into 4.9 extra fantasy points, 0.7 more than either Manning or Osweiler. Taylor also rushed for a garbage score, and with that, his passing touchdown to Deonte Thompson, and his yardage, Taylor put up 18 of his 29 total fantasy points in garbage time. That didn’t help the Bills come back against the Jets, but his fantasy owners appreciate it. Taylor was the No. 1 fantasy quarterback this week and is now 12th for the season. Taylor is definitely usable in fantasy, but don’t expect other garbage-time outputs like this week’s. Even with his 4.9 extra fantasy points from Thursday, he has just 6.1 extra points in total this season. That’s 15th-most among quarterbacks. Matt Ryan is in the No. 4 spot in garbage benefit this week, and that is par for the course against the Panthers’ defense. When games are competitive, the Panthers are a nightmare for opposing offenses. This year, they’ve allowed the sixth-fewest yards and touchdowns per play in normal time. However, they have a tendency to allow their opponents back into games in which they build two-score leads. Of the 20 teams that have played at least 50 defensive snaps in garbage time, the Panthers have been the fifth-most-generous team in giving up yards. 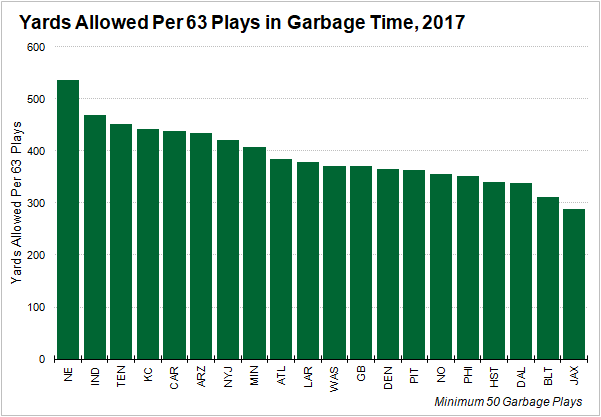 At 438.7 yards allowed per 63 garbage plays — which is my approximation of a typical full game — the Panthers are nowhere near the Patriots, who have allowed almost 100 more yards per 63 snaps than the Panthers in garbage time and almost 70 more yards than even the No. 2 team, the Colts. However, the Patriots have also allowed the most yards per play in normal time. When you compare defenses’ yards allowed in garbage time and normal time, the Panthers and Patriots are right next to each other, allowing 97.3 and 112.2 additional yards per 63 plays in garbage situations.